1990: fMRI was discovered. Many studies started using it to study cognition, emotions, and personality. This study was awarded the notorious and farcical-minded IgNobel Prize. 2010: Dr. Russ Poldrack at Stanford University started an Open fMRI Repository for scientists to store and share their research data so others could look at and reanalyze them if needed. Not all researchers participated. 2013: Sally Satel, MD, published a book entitled Brainwashed: The Seductive Appeal of Mindless Neuroscience, criticizing the deception of fMRI reports: “You’ve seen the headlines: This is your brain in love. Or God. Or envy. Or happiness. And they’re reliably accompanied by articles boasting pictures of color-drenched brains.” Dr. Satel criticized the rise of “neuromarketing” and profiteering from the marketing of neuroscience. 2016: The most prestigious scientific journal is Proceedings of the National Academy of Sciences (PNAS). The National Academy of Science was founded by President Abraham Lincoln in 1863 as “Advisors to the nation on science.” Membership in the Academy is by invitation only. Of just over 2,000 members, nearly 200 are Nobel Prize winners. 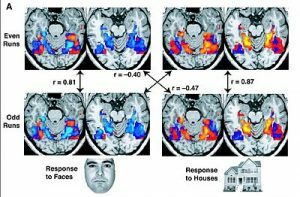 The July 12, 2016 issue of PNAS reported a study by Swedish and British scientists looking at fMRI software: “Cluster failure: Why fMRI inferences for spatial extent have inflated false-positive rates.” The authors examined the three most commonly used fMRI software programs, used by 80 percent of researchers, using data from the Open fMRI Repository at Stanford University. The Swedish-British researchers conducted three million task-group analyses of fMRI data, using the data of people at rest (null data) who weren’t engaged in any cognitive activity. Scientifically, these brain images should show no activity on fMRI scans. They discovered that over 70 percent of images showed false-positive correlation. The conclusion: “These results question the validity of many of the 40,000 fMRI studies.” fMRI and false positives study. Using coin-flip to guess on brain science of love is more reliable than fMRI, as simple coin-toss gets the correct results 50 percent of the time, while fMRI gets it right less than 30% of the time. The fMRI is not the best way to see the functions inside the brain. The fMRI is based on questionable science.